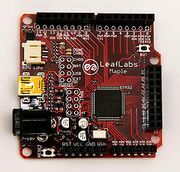 This is a page about the LeafLabs STM32 boards, such as the Maple - an open source hardware and software ARM Cortex M3 single board computer with Arduino-compatible expansion connectors and form factor. STM32 page at STMicroelectronics - the system-on-chip that the Maple uses. Get STM32 reference manuals and application notes here. Maple JTAG How To Maple JTAG How To - how to use Maple's JTAG adapter for debugging; how to build a Maple JTAG adapter; re-flashing the board; and more (at the LeafLabs wiki). The Maple is a microcontroller board with Arduino-compatible pinout; for other microcontroller boards with Arduino-compatible pinouts (and shields that plug into the Maple and those other Arduino-compatible microcontroller boards) see Arduino Links. The Maple includes an ARM processor; for more information, see ARM links. This page was last modified on 17 February 2011, at 07:48. This page has been accessed 13,568 times.